If women were to take over the world, would the world be a better place? This is the question that fueled the fires of The Dawson Theatre Collective all year long, as they prepared for their on-stage production, HomoSimian. A study of gender, the play prompts the audience to answer the question themselves as they watch, explained director Ann Lambert, who has taught at Dawson for the last 26 years. HomoSimian, premiering May 10, was put together by The Dawson Theatre Collective, an open group composed of current Dawson students, faculty and alumni. 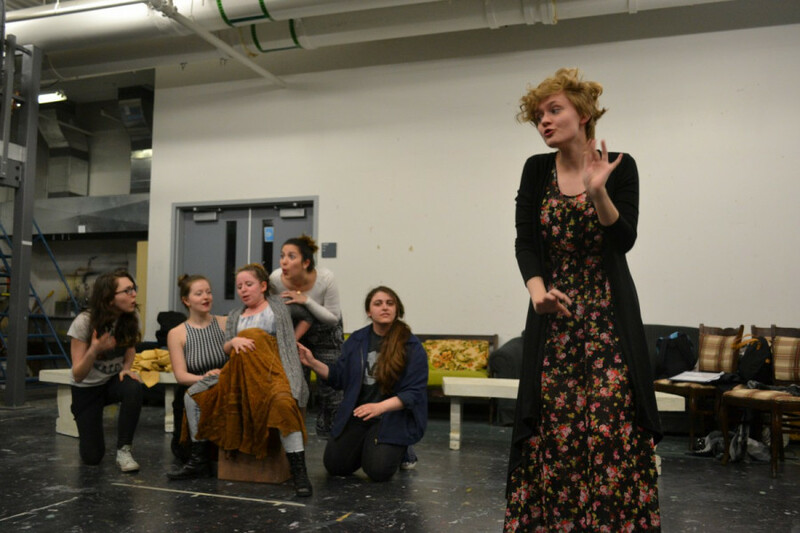 DTC alumni have also started an amateur theatre club at Concordia, called the A.C.T. Club, which was inspired by and operates similarly to the DTC. “The nice thing about the DTC is that it’s a family that continues to span beyond people’s time at Dawson,” said Alice Abracen, Lambert’s daughter and an alumna who was part of the collective five years ago. Abracen volunteered her efforts in writing lyrics and painting set props. The collective welcomes past students, many of whom study at Concordia or have gone on to pursue further studies—in theatre or otherwise—she explained. The proceeds of the play will go towards “The Theresa Foundation”:www.theresafoundation.com, founded by Lambert’s mother, which organizes assistance and projects for grandmothers and children affected by the AIDS epidemic in Malawi. Set in 2035, the play follows the life of a refugee colony that has taken up shelter on Mount Royal. The setting is post-apocalyptic—food is low, water is scarce and the comfort of the mountain is questionable. The characters are forced to cope with the damage done to the earth by climate change. According to Lambert, the inspiration behind HomoSimian was based on a study conducted by Robert Sapolsky. Placing focus on human stress, Sapolsky studied the complex social life of African baboons, in an attempt to find how stress and power structures affect the wellbeing of a social group. “If you’re a gazelle, you don’t have a very complex emotional life, despite being a social species. But primates are just smart enough that they can think their bodies into working differently,” explained Sapolsky in his study. With this as a starting point, HomoSimian looks at this question in the context of male versus female leadership. When the Alpha Males die off “for their greed”, as actor-writer Cheyenne Schaub put it—the refugee colony finds itself without dominant males, and suddenly under the guidance and in the care of the females. Combining themes of gender equality and environmentalism in a theatrical context, Lambert hopes that the play will tackle these issues while keeping things light.